When you vision the lifestyle of living on the southern most part of Florida on the island of Key West, you probably think of relaxing on a hammock, taking in a cool breeze, sipping a refreshing beverage, soaking in some sun and admiring the beautiful blue ocean water waves along the lovely white sandy beaches, but there is another side of life that dates back to centuries ago. With a visit to the Key West Shipwreck Treasure Museum, you'll incredibly learn and interestingly experience firsthand what it feels like to go out into the immense depths of the water in search of sunken ships. The Key West Shipwreck Treasure Museum offers several ways to soak up the experience with highly interactive displays, fun video presentations, actual valuable bounty recovered from numerous lost ships that have now been successfully recovered. Most famous is the wreckage of the Isaac Allerton which was lost in an all too common tropical storm back in the mid 1800s. Find out what it took in strength and determination to recover all of its treasures. Did you know how much a Spanish galleon actually weighs, well, you can find out by trying to uncertainly lift one at the museum. 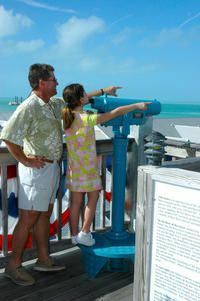 While at the amazing Key West Shipwreck Treasure Museum, you will have the opportunity to go up on an old, original observation tower that is an incredible 65 feet high and take in the view of the immense water surrounding from every angle. Imagine what it was like looking and waiting for a loved one on a vessel to arrive and the agony of them never returning. Sometimes we get caught up in the riches, but we must also remember that there were sadly many lives lost, too. Thankfully the fortunate crew aboard the Isaac Allerton was able to make it to the beautiful Key West shore safely. This is a wonderful, educational family adventure; you should check out the available schedule and visit soon! It truly is a double bonus to have a good time at a treasure museum and simultaneously new fascinating facts at the same time. Think of it this way, you'll gain a substantial treasure chest full of new information and explore opulent treasures, too. Your shipwreck voyage begins in 1856, the year the Isaac Allerton sank. On your visit to the Key West Shipwreck Treasure Museum, view artifacts from this ship, one of the richest shipwrecks in Key West history. Spend hours exploring the remnants of old ships and learning about the fascinating salvage industry through artifacts and interactive exhibits. Learn about how shipwrecks became a profession that made Key West one of the richest cities in America. See what it was like to work in the dangerous shipwreck scavenge industry back in the mid-19th century, as well what sorts of rewards were reaped. Sift through artifacts and watch informative video presentations as you dive deeper into this fascinating world. Watch actual underwater footage of a shipwreck. And summon all your strength to lift a silver bar salvaged from a Spanish galleon. Learn the intriguing story of the Isaac Allerton. Many of the treasures throughout the museum were excavated from its watery grave. Find out about the people who struck it rich risking their lives to recover wealth from the sea. Then do as the ship captains once did and climb a 65-foot (20-meter) observation tower for the pinnacle of your museum experience. Departure Times: 9:00am to 5pm Hours are subject to change without notice. It is advised that you call prior to your date of travel to reconfirm hours of operation.